Massive storm has hit Montpellier on Monday. Within three hours some 250mm of water fell from the sky and overall the rainfall reached nearly 300mm. That’s 47% of what the city experiences per year! The sewage system wasn’t able to carry all the water and local rivers began flooding buildings. 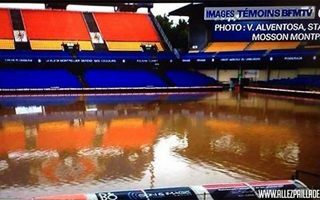 Stade de la Mosson was among those affected badly, because La Mosson is the name of a small river lying next to it. Yesterday it wasn’t small any more, covering the entire field, destroying the LED advertisement boards and flooding most of the facilities underneath the main stand (changing rooms, fitness centre, media centre, parts of club office space). As evaluation continues the size of damages is not yet known. But youth players of the club were today called to help and remove some of the damages. While Stade de la Mosson is in the scope of our interest, in total some 4,000 people had to be evacuated and we hope their lives will return to normal as soon as possible.